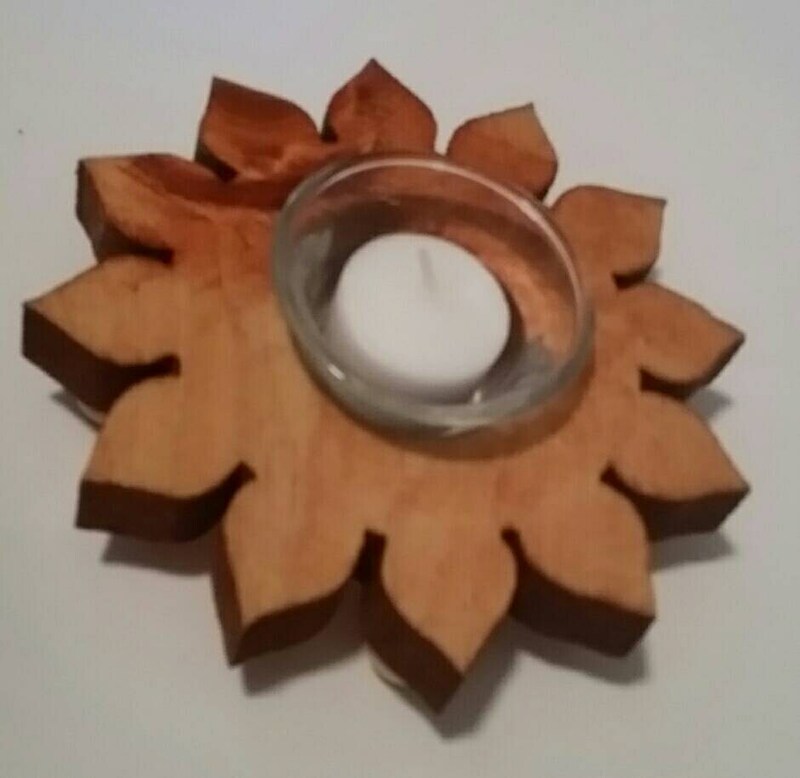 The Sunflower Candle Holder with votive glass cup is designed for those that love sunflowers. The glass cup on the Wood Sunflower adds safety when it is used as a centerpiece on a dining room table, reception table, restaurant table, or just a kitchen table. Sunflower candles are one of my daughters favorite items I make (at 3 years old she has particular tastes.) The center glass cup adds safety to the holder but also adds protection to the holder when on a table and allows for easy cleaning and replacement of the candle. The wood is stained with a reddish stain then several coats of a gloss acrylic finish for long life of the candle holder. The 4 round ball feet were left a natural color to provide contrast, then they too were given several coats of the acrylic finish. The holder measures 1 3/4 inches tall, 6 inches diameter. The holder comes with a white votive candle. If you need multiples of this candle holder please send me message and we can discuss your project. Turned out amazing!! My fiancé and I are super excited to use it for our wedding. Shipped quickly - packed well - exactly as described. I just love my candles and so well made for my special wedding day!!! Many of my items are completely customizable. I can alter my candles, signs, or scroll saw products to specifications you would give me. Convo me at anytime and I will respond to discuss the project. Though this might take additional time to accomplish. The wood items shown are already made so are ready to be packaged to ship. Care with the candles is the same as with any candle. Place them out of direct sunlight. If storing them place them in a dark dry cool location. All of my candles come in plastic bags that can also be used in storage. Care for the wood projects is easy. To clean just wipe them down with furniture polish or a damp towel. Do not submerge them in water. I add the height, width, and depth of all my projects to the description. If you have a specific question or if the description is missing the size details please convo me. Some of my items are available in bulk orders, however all of my items are handmade and therefore will differ in appearance slightly. Please contact me to discuss what you might need. I hand make all of the wood items in my shop. I personally embed the images in the candles. While I do use a computer to design the items and power tools to make them I do not use CNC machines or manufacturing facilities. Handcrafted items are the only items I will sell. I perfer the slight and subtle differences that make the items unique. I usually ship only USPS Priority Mail or First Class. Some of the bigger projects I am working on may require shipping UPS or Fed Ex in the future. If that in the case it will be mentioned in the description.